Wild, weird and most definitely wonderful, we couldn't be happier to see Echobode unchained from Reason and bestowed upon users of other hosts. Get it today. Awesome sound. Stunning presets. Versatile. Numerous effects. Great value. Control set could appear intimidating to novices. Sonic Charge has a reputation for making esoteric plugins with oodles of character, and the likes of Bitspeek, Permut8 and Microtonic can be heard on many a club hit. Such distinctive instruments and effects suffer from the drawback that they're easy to overuse, narrowing their longevity and customer base, but whether by fluke or design, Echobode leaps over that particular pitfall by being a plugin that's also useable as a more 'everyday' effect. "It is about as versatile a plugin as we've ever encountered. It's almost impossible to fault Echobode"
This powerful processor has actually been around since 2012, but only as a Reason Rack Extension - now everyone else can taste its sweet fruit thanks to the all-new VST/AU plugin version. Echobode is, at its heart, a delay with a frequency shifter in the feedback loop. The latter is based on Harald Bode's Bode Frequency Shifter (see Bodacious sidebands) - used alone, it creates inharmonic, bell-like timbres, but placed in a delay line, the possibilities explode. In addition to being frequency shifted, the delay signal can be filtered and phase shifted in stereo. The shifter, delay, phase and low-pass filter can all be modulated, too, using an LFO outputting your choice of sine, downwards saw, square and random wave shapes; and the delay, LFO and frequency shifter can each be synced to host tempo. There are controls governing the actions of the delay, filter, LFO and frequency shifter, and through the interaction between them, an initially bewildering range of sounds is evoked. It can take some time experimenting - particularly with the frequency shifter controls - and analysing of presets before you feel comfortable crafting your own, however, and some may find it all a bit daunting; but those users can find solace in the superb presets. The upshot of all of this is a staggeringly expansive range of effects - chorus, delay, reverb, phasing, flanging, tremolo, gating, ring modulation and more - ably demonstrated by the extraordinarily broad and consistently excellent preset library. There really is no type of signal that Echobode can't enhance in one way or another, from glorious stereo chorusing and funk-imparting delays to otherworldly mangling and roof-raising rises. It is about as versatile a plugin as we've ever encountered. It's almost impossible to fault Echobode, but we would love to see the addition of a random patch generating button. With a plugin where small tweaks can have such a profound impact on the sound, it's always fun to be able to randomise the controls and see what emerges. 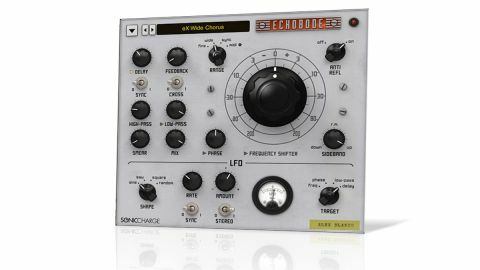 We're used to quirkily classy plugins from Sonic Charge, but Echobode is something else. It is that rarest of things: an effect that's both a one-stop preset shop for making every kind of signal bigger, more luscious and expensive- sounding, and an extreme creative effect machine of the type you might only need once in a while, but you'll be extremely glad of it when you do. Oh, and it's great for builds and drops, too. File this one under 'no-brainer'.